I don’t normally share words on wordless photos but no one got the [ahem] artistic POV [you heard me] of this one—so I feel the need to explain. Well, that looks quite comfy! Lucky kitty! Wouldn’t you just love to curl up like that … sleep like that? Great shot, Carin. I know it’s wordless, but I swear I can hear purrr … purrr … purrr (kitty snoring). Now that’s the life! No words needed. 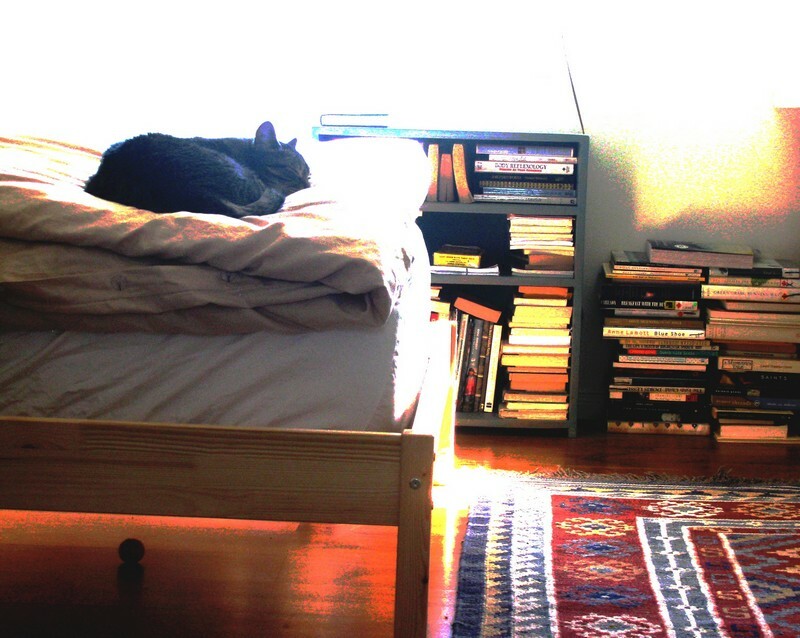 Cat, sunshine, books, more books, glowing carpet …more books still…! What a lovely composition. Makes me want to peruse that bounty of ready reading, hop up on that comfy-looking bed, grab the kitty, and, well, read read read…! The original shot was just of the cat. Because I don’t have enough of him sleeping. [ahem] But then as if by magic, through the viewfinder, the sun appeared and a few other things… Funny how the world looks so very different sometimes through that little square. Of course, anyone would want to just be in that room – I know I would. Curled up on the bed with the sun streaming in with any one of those good books at hand, kitty snoozing beside me. Bring my cup of tea please! All is well with the world when sun shines in on books and cat. There he sleeps that little cat that peeps out at us .